I know many people who want to learn to play the piano since they want to play The Entertainer by Scott Joplin. The Entertainer is one of the classics of ragtime, it returned to top international prominence as part of the ragtime revival in the 1970s, when it was used as the theme music for the 1973 Oscar-winning film The Sting. Now I know you don't wait until you're forty to play this one since it's a really hard tune so I worked hard to create an easier arrangement of the Entertainer and I added a really nice piano sheet to go with it. Click here if you haven't signed to Piano Playground, our free E-zine yet make sure you do that in order to get the username and password codes for the free piano tab I provide later on this page. 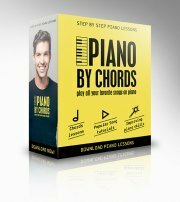 (And I'll update you with all the new free piano lessons! 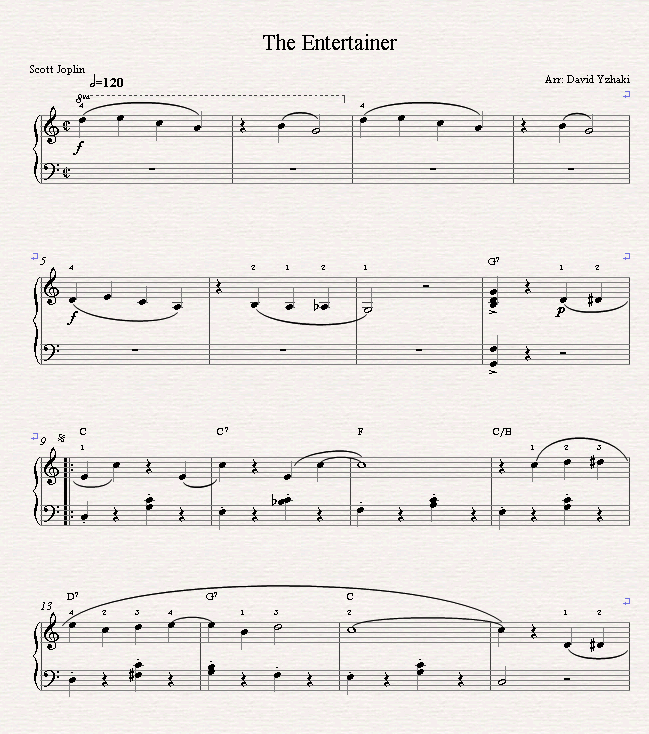 Click here to download the Entertainer Sheet Music. It's best to first follow the piano tutorial, first work out the right hand, then the left hand and combine them only at the end. If you want to learn more about reading piano notes you should definately check out the Rocket Piano Ultimate Learning kit. Rocket Piano provide an amazingly handy and effecive piano course on various issues such as reading piano notes, playing piano by chords, piano technique and more. You're going to love the way they work systemically with the help of their useful audio and video files that are short and to the point. By working with Rocket Piano you basically guarantee that you'll become pro at reading piano notes (And the big bonus is you'll learn to play piano by ear as well). Check out the Ultimate Piano Learning Kit of Rocket Piano Now! Oh, and if you play this song nicely please record yourself and let us see how you play it in the piano forum. We would love to be inspired each other!